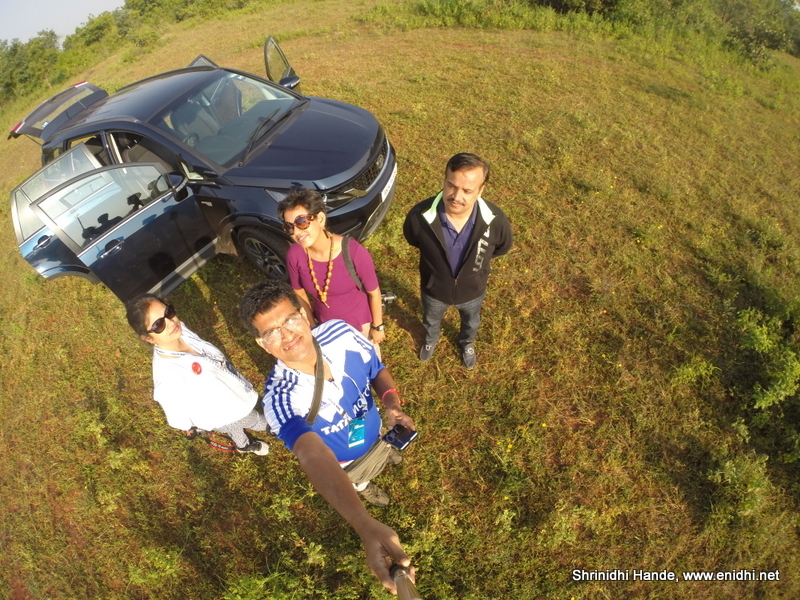 This post covers the #HexaExperience event. Detailed review of Hexa will be done in a separate post. Just about a week ago, an email from Indiblogger landed in my mailbox indicating a Tata Motors Hexa bloggers meet at Hyderabad. I registered immediately and the wait began. Media drives or pre-launch meets are a great opportunity for auto enthusiasts to learn more about the new vehicle, first hand from the mouth of the very people who built it. Missing such an opportunity was just not an option. I rescheduled a BLR visit I had planned and waited for the confirmation call. On 19th evening, the call came and I was on cloud 9. This would be my 8th Indiblogger meet and 5th with Tata Motors (Other Indiblogger meets were Tata Grande Meet, Tata Nano GenX meet, The Chosen Ones, Zica meet, Ambipur meet, BNLF and the Flikpart Outdoors). I’ve also done few other events with Tata Motors- The Safari SOUL Drive and Tata Nano Superdrive, to name a few. 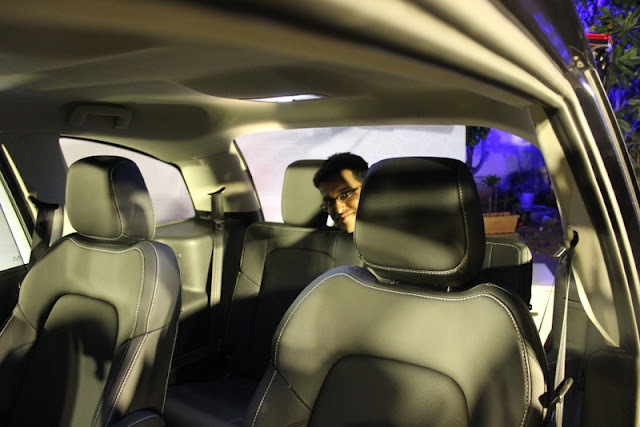 I was so happy that this association with Indiblogger and Tata Motors is continuing with Hexa event. Next day we got better picture of who else are attending the meet- a good portion was regular Indibloggers whom I had met at previous events and there were many new faces too. 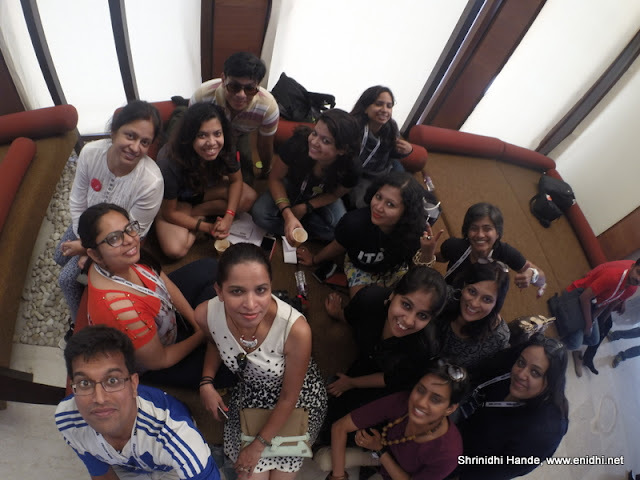 Besides experiencing the vehicle, Indimeets are eagerly awaited by Indiblogger for the opportunity it presents to connect with other bloggers. I started preparing for the meet by reading up about the Hexa. 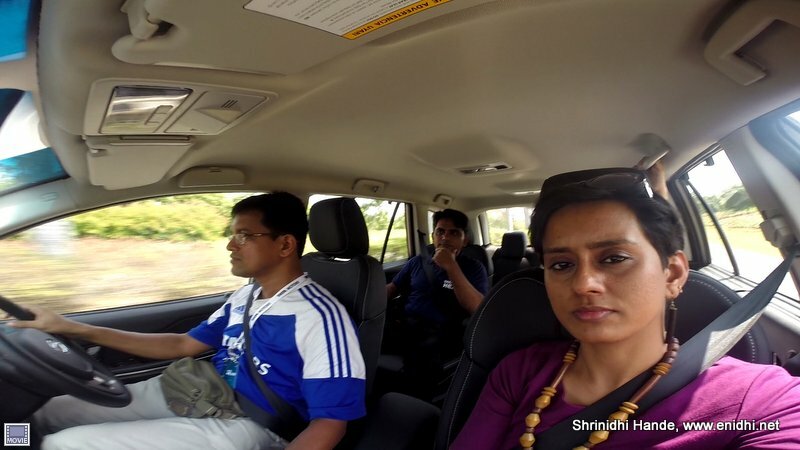 The week-long media drive was already in progress where journalists from mainstream media were experiencing the Tata Hexa, so a fair amount of information was beginning to trickle down, but nothing like experiencing the SUV on our own. Hyderabad was where I began my career in June 2005. Had arrived there with one suitcase to report to my first job. After that, On and Off I have spent about 2 years in Hyd before relocating to Chennai. Lots of things have changed since my last visit- Hyd is part of new state now (Telangana), the company I used to work for is history, Hyderabad has got a new airport and so on. 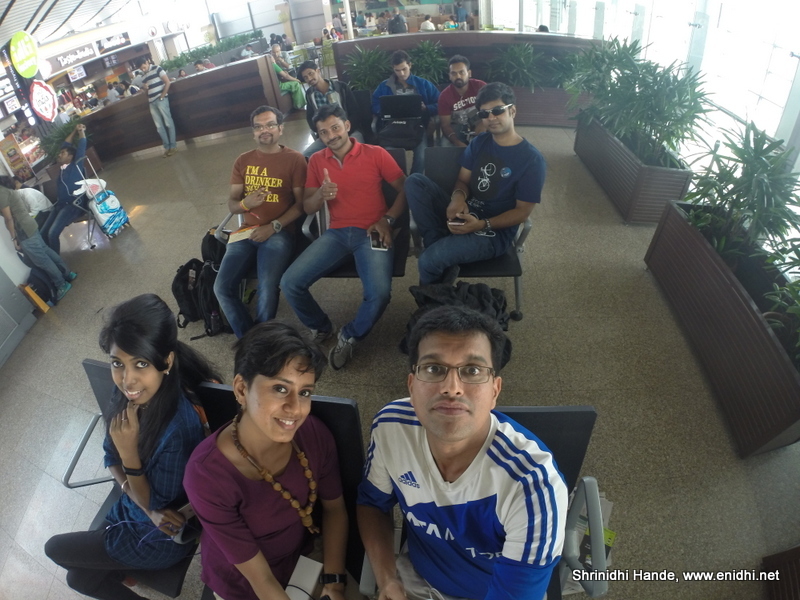 Also this was my first time to Hyd by air, as during my initial days there flight was not affordable to us. Though many bloggers suggested that Goa is a more scenic place for media drive, I was glad the drive was happening in Hyderabad. Besides me there were 7 others from Chennai- Sarath Babu, Satheesh K, Karthik Murali, Gowthama, Srinivasan, Bhushavali and Shameem Rizwana. We met at Chennai airport and reached Hyd on time. The venue was Novotel Hyderabad Airport. As we reached the venue, the Bengaluru team had already reached. Met Rajiv Verma, Ami Bhat, Indrani Ghose and others during lunch. Post lunch, went to room and headed out after a quick refresh. Our media kits were waiting for us, with a badge, schedule and other accessories. There were two Hexas on display in the hotel garden, one with all camping accessories. I took a series of photos here- Indrani, Bhushavali and other bloggers also joined us. Below: Bhushavali clicking Shameem Rizwana in action. Two subsequent pictures were also clicked by her. In the evening, we went through a media presentation from Tata Motors staff. shish Sahani, Head of Digital Marketing opened the session. We could learn about the key features of the Hexa, the idea and process that went behind the making of this beauty+ beast of a vehicle from Tata motors, from the mouth of very people who designed and built it. I will detail Hexa’s features in a separate post as I review the vehicle. Similar to Zica, Tata’s design teams spread across the globe – UK, Italy and India have worked on Hexa’s design. It uses same chassis/platform as Safari (X2) but rest of the vehicle is all fresh build from scratch. It is NOT a face-lift on top of Aria. Pratap Bose (PraBo) was missing- apparently he had to return early. Team Tata fielded various questions from the bloggers. Richard Winsor, Chief Designer, briefed us on the designing process the car has gone through. That evening, I put my new 50 mm prime lens to some experiments, with some tips and guidance from Rajiv Verma. Fashion and Travel Blogger Bhushavali was happy to pose for my lens and below are 2 of the best clicks that evening. More experiments with 50 mm- one with Hexa in Focus and the other with candles in focus. We were asked to form a team of 3 people each. 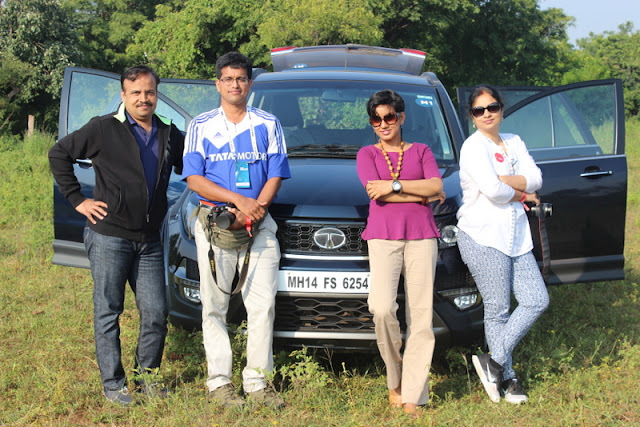 A total of 20 Tata Hexas were lined up for us (60 bloggers) to drive. My team consisted of Indrani Ghose and Bhushavali. There was a stand-up comedy and gala dinner. In between, I also met Nishcal Ram, who came all the way to the hotel to meet me. Nishcal and his wife Niharika were one of the couples who were part of Ford Figo Discover Smart drive, held some 6 year back. It was great meeting him after such a long time. There was a caricature artist around but I missed it. Met many other bloggers- Sandeepa and Chetan, Aravind Passey sir, Vikram Kamboj, Mousam of Swati & Sam team, Atul Maharaj, Manoj Dubey, Ananth V, Supriya Himanshu, Maitreni Mishra, Ruby Singh and many others. (If I have interacted with you but have missed listing your name, it is purely because of my poor memory- please pardon me) I went to bed at about 10.30 PM as we needed to start very early next day. I did miss out on clicking Hexa's ambient lighting and follow me home lighting. Day 2 was the big day. We had to get up at 5 AM, Check out and head for breakfast. The drive would begin at 6.30 AM. We were to go on a 170 km long drive- 85 km one way to a resort somewhere near Vikarabad and back. 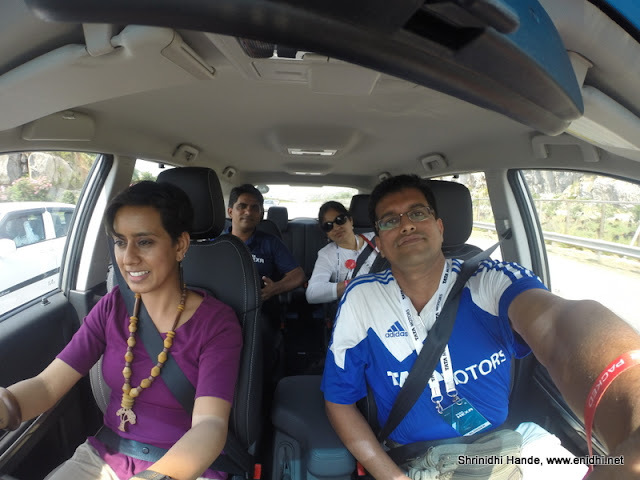 We drove the manual transmission for the onward journey and swapped to an Automatic Hexa during the return. This was the longest media drives I have ever had. The route was carefully selected to include all kind of roads- scenic 4 lane road to airport, super-fast 6 lane expressway for 10 kms, curvy 2 lane roads and a bit of not so good road at the end. Helped us experience the Hexa in all kind of road conditions. I drove for the major portion of this route, while Indrani and Bhushavali drove for the remaining portion. Mr. Anand Kulkarni from Tata Motors was with us, clarifying my doubts and providing information about the vehicle where required. Once back at Novotel, an off-road experience was waiting for us. This 20 minute drive took us through various kinds of terrains- deep ditches resulting in cross axle, ice, steep slidewards incline, steep descent and ascent and so on. I have given a detailed account of Hexa’s Off Road abilities and our experience in this post. 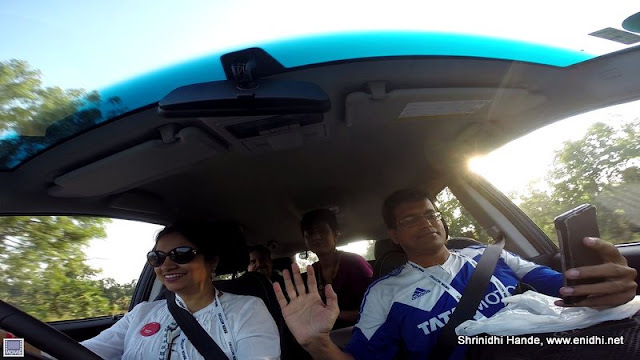 We gave our feedback, gave video bytes, had nice lunch, took some rest and it was time to head back to airport, marking an end to the yet another wonderful experience and get-together coined for us by the Indiblogger team and Tata Motors. Chennai Bloggers returning home- one last pic. Thanks to Indiblogger and Tata Motors for yet another wonderfully coordinated event and giving us memorable experiences. A comparison of Tata Hexa with its rivals- Innova Crysta and XUV5OO is now live here. My comprehensive review of the Hexa SUV is now live. Definitely! May the Hexa be successful and enable Tata Motors to launch more n more cars and invite us more often!